Among the holdings of the Special Collections Department at Brandeis are some dozen nineteenth-century gift books. Gift books were a popular genre of literary annual in the mid-1800s in England and subsequently in the United States; they included verse and illustrations and short stories, often romantic or moralistic, and were designed to be given as presents to daughters, sisters, and the like. Many were edited by women. Titles held by Brandeis include, among others, The Snow-flake: A Christmas, New-Year, and Birthday Gift (Philadelphia); The Golden Gift: A Wreath of Gems from the Prose and Poetical Writers of England and America, Prepared Especially as a Gift Book for All Seasons (Boston); The Token and Atlantic Souvenir: A Christmas and New Year’s Present (Boston); and The Lady’s Album: A Gift for All Seasons (New York). Brandeis has contributed several editions to the Internet Archive, where a number of digitized gift books are available. While the content of gift books was certainly read and enjoyed by their recipients—and includes such authors as Longfellow, Poe, and Emerson—gift books also have artifactu al significance, as reflected in their design. Some boast of the whiteness of their paper or the singular beauty of their illustrations. The Snow-Flake of 1852 notes that its nine original illustrations are "by artists of established reputation, and are all of a character both to promote and gratify a refined taste." 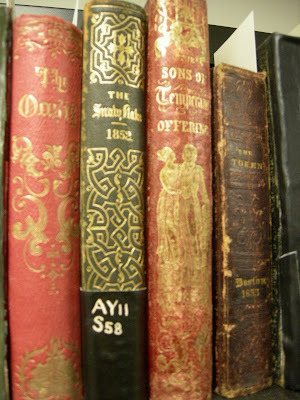 Many are finely bound, with decorative covers. The popularity of gift books gave rise to such publications as Godey’s Lady’s Book, a popular Victorian literary publication for women, begun in 1830. Modeled on gift books, Godey’s included fiction as well as poetry, engravings, household advice, and articles on fashion, gardening, needlework, and other domestic undertakings. Sarah Hale was the editor of Godey’s Lady’s Book for some four decades; she published original work by American authors, including the writing of many female contributors. The gift books held by Brandeis, like other rare materials, are used by faculty in their classes to provide students with the experience of working with original, physical texts. There are many reasons to use original print resources, even for materials that are available in electronic format. An original allows a student to see a work of literature in its original context, to see what was published alongside it: news stories, advertisements, announcements, poetry, illustrations, works by other authors in juxtaposition. The experience of looking at the very same ite m the original readers saw is a useful point of reference. Also, the physical object itself can provide contextual cues; e.g., the elaborate bindings of gift books make a point about social class and intended recipients. Looking at an original item can give a better understanding of the physical and material contexts of a short story, for example; the publishing standards, protocols, and formats prevalent during the time a work was written affect its content. Different modes affected the way people wrote and the way they read. Seeing a work in its original form can help a student think about the historical authenticity of reading and literary production. The gift books held by Special Collections are cultural, historical, and literary artifacts, enjoyed by their recipients in the nineteenth century and enjoyed by students of literature today. See a list of gift books held by Brandeis Special Collections here.